A few weeks ago I inaugurated my Cuisinart ice cream maker by making chocolate sorbet. Not my best performance, the texture was off, a bit grainy. I guess I didn’t melt the chocolate well enough before chilling the base. I must try another recipe, as it is Phil’s favorite flavor, but in the meantime I picked his second favorite flavor and went to work. Watermelon sorbet was a lot more forgiving, refreshing and light, perhaps a tad too sweet. Next time I’ll up the lemon juice and reduce the sugar slightly. In a medium saucepan, bring the sugar and water to a boil. Reduce the heat and simmer without stirring until the sugar is completely dissolved.. Place in a bowl to cool to room temperature. Put the watermelon chunks and the lime into a blender or food processor. Pulse about 20 times to chop the melon, then process until the watermelon is completely pureed. Press the watermelon through a mesh strainer, and combine with the cooled sugar syrup. Chill in the refrigerator for at least one hour. Pour the mixture into the frozen bowl of your ice cream maker and mix it for 25 to 30 minutes, or according to the instructions on your machine. The sorbet will have soft serve texture. You can enjoy right away or put the sorbet into an airtight container and place in the freezer until firm for about 2 hours to firm it up. Comments: I am in love with our Cuisinart ice cream maker! The watermelon mixture seemed VERY liquid to start with, I wasn’t sure it would ever turn into a sorbet, but the machine kept churning, the crystals started forming, and in a little less than 30 minutes I had a delightful batch of watermelon goodness! A little liquid stayed at the bottom of the machine, I am not sure if one should open it midway through the churning and scrape the bottom, but it did not compromise the results. Watermelon is by nature very sweet, so next time I’ll use 3/4 of the amount of sugar, perhaps even half, and see how it goes. Go to Smitten Kitchen for a fabulous chocolate sorbet recipe! I think part of the trick is whirling it in the blender before freezing, too. I use that recipe all the time, and it always comes out great. You don’t have to even have a machine, it will freeze beautifully in a casserole…just stir occasionally. I have bought the Cuisinart ice cream maker and given it as gifts several times and keep thinking of getting one for myself. Mine requires ice but makes great ice cream. I love how simple this is. Note to self buy ice cream maker, practice lots! Maybe one of these days I’ll bread down and get one. For now…I’m still practicing breads. 😉 This looks very refreshing and I LOVE watermelon! Sally, not only does your sorbet sound delicious, the color is simply stunning! What a beautiful picture that is. You’ll find a good chocolate sorbet recipe for Phil; I’m sure of that. 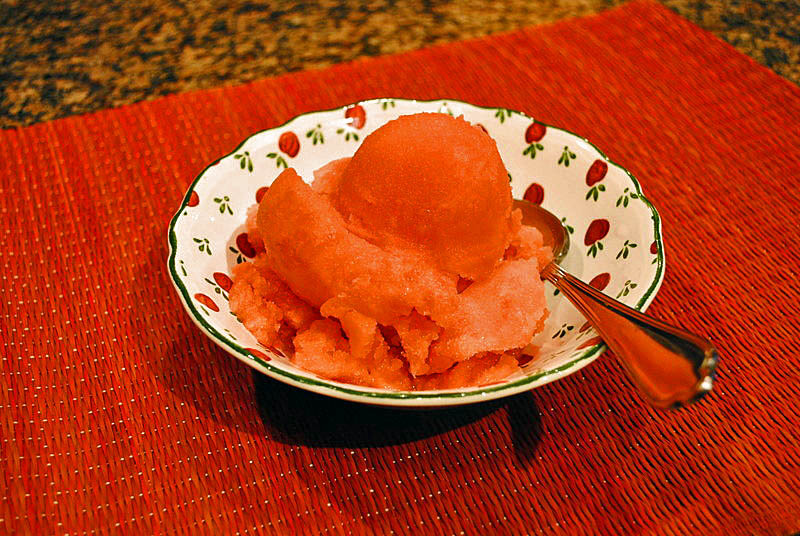 I don’t have an ice cream maker but may need to break down and buy one soon… so many wonderful recipes – I love watermelon and this sorbet looks delish! (so pretty too).